QR codes were invented by Toyota subsidiary Denso Wave in Japan in 1994, and were originally used for tracking vehicle parts in auto factories. Denso Wave trademarked the term QR code and owns the patent rights, but does not exercise those rights, which makes the technology freely available for creation, distribution and use. 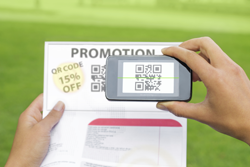 QR codes are 2-D or two-dimensional, meaning that data is stored both horizontally and vertically. 1-D codes are one-dimensional, because they only store data horizontally, such as UPC codes which you find on greeting cards in stores that keep track of inventory or sales, or Postnet barcodes which the post office uses to designate where mail will be delivered. An advanced 2D barcode lets you scan horizontally or vertically and is capable of storing 7,089 numbers and 4,296 letters and numbers and 2,953 bytes (but be careful not to overload). Many cell phones come pre-installed with QR reader software. If not, free apps are readily available to download. A code can be reproduced on any surface with sufficient contrast. The term “hardlinking” refers to the action of scanning a code on a real-world object to access online information. Most QR codes are black and white but can be in color and be branded. A QR code is just a link/shortcut to a URL, phone number or email address. A positive is that the printed substrate can be damaged and can often still be read, even with up to 30% of the QR pattern missing or degraded. All QR code readers can decode embedded website URL’s, but the readers vary in features and some do not support more advanced options like automatic entry of calendars and contact information. Some readers decode better than others. The quality of the phone, camera, lighting and steadiness of hand also affect the ability to correctly read a QR code.